Coming face to face with a manta ray is one of the most unforgettable experiences you can have underwater. These huge creatures – sometimes up to 4 metres in their wingspan – are also incredibly graceful, and to watch a manta ray glide silently through the water and sometimes perform breathtaking acrobatics is something I never get tired of. The first is Koh Bon, which is where I saw my first manta. Koh Bon (Thai for “Island of Hope”) is just north of the Similan Islands proper, and an essential destination in any Similan Island liveaboard trip. Koh Bon’s major dive site is known as “The Wall”, and this area is famous for seeing mantas. It’s a sheer vertical drop from the surface down to about 15 metres, and then the ground levels out into a slight slope covered in staghorn coral. Moving parallel to the wall, divers can often see mantas come swooping in from the blue, suddenly materialising from nowhere. When I saw my first ever manta, I was following Koh Bon’s wall with uber dive guide Gerald from the Dolphin Queen liveaboard. I glanced to my left, carried on looking forward, and then did the classic cartoon doubletake, my eyes almost popping out of my head. Right beside me, only a few feet away, was a manta ray in all its blackclad winged glory, moving effortlessly along the wall in parallel with Gerald and I . It stayed with us for a few seconds and then swiftly, unhurriedly outstripped us before languidly wheeling back out into the blue. The five times I’ve dived at Koh Bon since, I’ve seen manta rays there every time. Friends of mine who work on Similan liveaboards and so visit Koh Bon every week tell me that over the last couple of years, the number of mantas sighted has been declining a little, but they are still spotted regularly at Koh Bon, so I would say this is still the best place to see manta rays in Thailand. The mantas tend to show up more regularly from January through April in the season., but have been seen there in November and December too. It was at Hin Daeng that I had the best dive of my life – 5 manta rays and a whale shark on the safety stop. 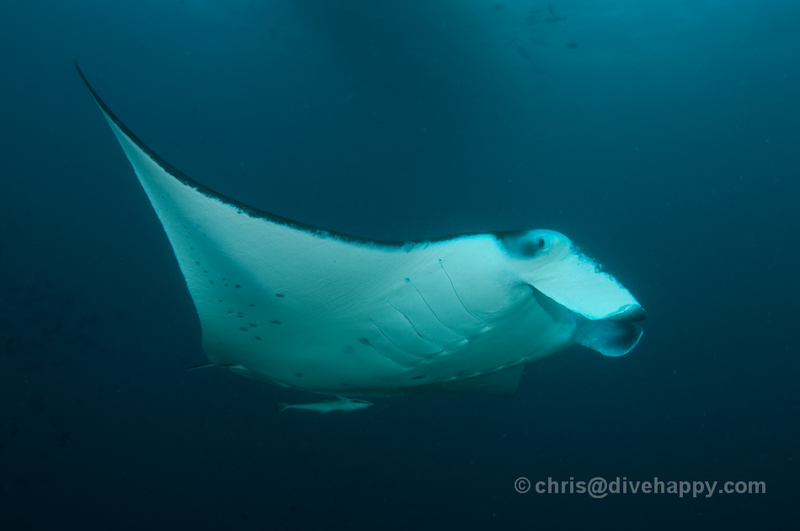 I wrote about this in my article about Koh Lanta for Asian Diver magazine, Manta Ray Paradise. Manta Rays are also spotted at Richelieu Rock and Koh Tachai (both near to Koh Bon on Similan liveaboard trips), but there are few other sites they can be seen. Manta rays are never spotted in the Gulf of Thailand (Koh Tao/Samui or Koh Chang).